What is covered, what not? You may notice that the native Free Pascal IDE (left) looks old, but it is shipped right along with the Free Pascal Compiler. In contrast to that the Lazarus IDE (right) looks up-to-date, but requires it to be installed additionally. My advise is nonetheless, use the Lazarus IDE. We need three different software packages. First of all we need the stand-alone Free Pascal Compiler or Lazaruse IDE (which already has a copy of the Free Pascal Compiler included). If you are not sure, I recommend to go with the Lazarus IDE package. Additionaly we need the original SDL library files (.dll files). And finally we need units that connect our SDL 2.0 code written in Free Pascal to the SDL library files. The latter will be done by Tim Blume’s SDL 2.0 units. This table provides all information and sources you need with respect to installation steps 1) – 3). Keep in mind, you have to download either the Lazarus IDE or the stand-alone Free Pascal Compiler, not both. http://www.lazarus-ide.org/index.php?page=downloads Linux and Mac OS X versions are here: http://www.lazarus-ide.org (see Downloads). Windows 64 bit version (needs 32 bit version) If you need the Linux, Mac OS X or other versions, check them out here: http://www.FreePascal.org (see Download). https://github.com/ev1313/Pascal-SDL-2-Headers On the right upper side is a button saying Download ZIP. Click on this button for the download of the latest release. *Better go with the latest availabe version (not version 1.72!) since some important bugfixes have been made lately. http://www.libsdl.org SDL 2.0 > Download > Choose the download suitable for your system. If you have Free Pascal or the Lazarus IDE installed already, you can skip the steps 1a) and 1b). 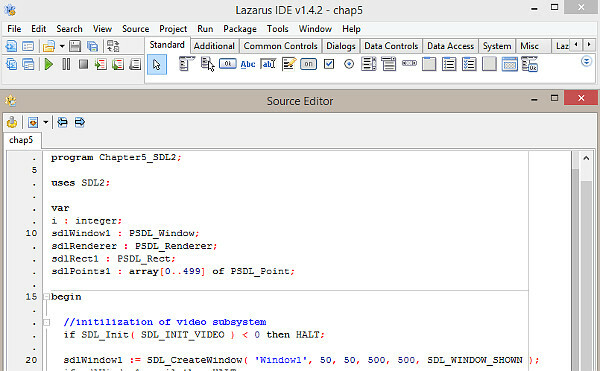 1a) For Lazarus IDE: Download the latest version of the Lazarus IDE. It has the Free Pascal Compiler accompanied. Remark: As of today (12/02/2016) the bundle doesn’t provide the most recent Free Pascal Compiler (3.0.0) but the version before (2.6.4). The tutorial examples will work with both versions though. 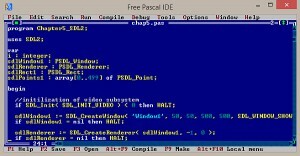 1b) For Free Pascal IDE: 32 bit Windows: Download the latest stable Free Pascal compiler, version 3.0.0 or higher. 64 bit Windows: You have two choices, 1) Simple way: Go with the 32 bit version of Free Pascal. (Recommended), 2) Install the 64 bit version of Free Pascal on top of the 32 bit version of Free Pascal. In this case you need both files. Hence, you need to download both Free Pascal installers shown above. 2) Download the latest version of Tim Blume’s SDL 2.0 units, better go with the latest branch (master branch), and do not use version 1.72 since it contains some bugs. Click on “Clone or download” and then on “Download ZIP” (see arrows in image below) of the page and make sure that Branch: master (not v1.72!) is chosen at the left side (see arrow in image below). This is important for any operating system: Windows, Linux, Mac OS X. Choose the master branch (1), click on “Clone or download” (2) and click on Download ZIP (3). 3) Download the latest version of SDL 2.0 runtime library, version 2.0.4 or higher. 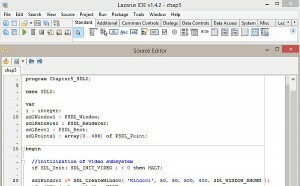 4a) For Lazarus: 32 and 64 bit Windows: Execute lazarus-1.4.4-fpc-2.6.4-win32.exe to install Lazarus for a 32 bit or 64 bit Windows system and follow the self-installer. Let the self-installer create a shortcut on your desktop. 4b) For Free Pascal IDE: 32 and 64 bit Windows: Execute fpc-2.6.4.i386-win32.exe to install Free Pascal for a 32 bit or 64 bit Windows system. Let the self-installer create a shortcut on your desktop. Don’t modify any checked options during installation process. The default path is: C:\FPC\[Compiler version]\. [Compiler version] should be 3.0.0 or higher numbers. 64 bit Windows only: After you installed the 32 bit Free Pascal, you may execute fpc-3.0.0.i386-win32.cross.x86_64-win64.exe optionally to add the 64 bit version on top. 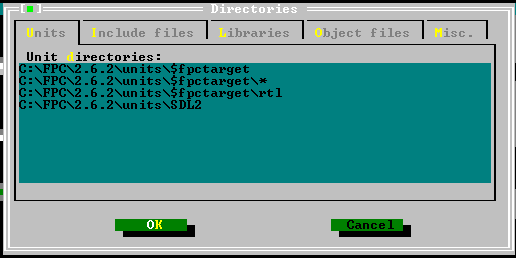 5) Extract SDL2-2.0.4-win32-x86.zip or SDL2-2.0.4-win32-x64.zip to get the SDL runtime library. This leads to two extracted files. There is a text file and the very important SDL2.dll. 6) 32bit Windows: Copy those files (especially the SDL2.dll!) to your system32-folder, C:\WINDOWS\system32\. 64bit Windows: Copy those 64bit files to your system32-folder (! ), C:\WINDOWS\system32\, Windows is expecting you to do this. Do not use the SysWoW64-folder (Hint: 32 bit files on 64 bit Windows go here). If it is not possible to copy the files into this folder (or you are unsure about its location) alternativly you can copy the SDL2.dll right into the same folder where the SDL 2.0 application (.exe) is located. That is because SDL 2.0 first looks for the SDL2.dll in the folder from which it is executed and if it isn’t found there, in the corresponding system folder! Anyway, if it isn’t found anywhere, the program will raise an error. Now you have installed Free Pascal and the SDL runtime library on your system. Finally Tim Blume’s SDL 2.0 units have to be installed. 7a) For Lazarus IDE: Extract the Pascal-SDL-2-Headers-master.zip. The Free Pascal Compiler is located in a subfolder called “fpc”. I suggest to copy all the files to a folder with full path C:\Lazarus\fpc\[Compiler Version]\units\SDL2\. [Compiler version] should be 2.6.4 or higher numbers. Skip step 7b). 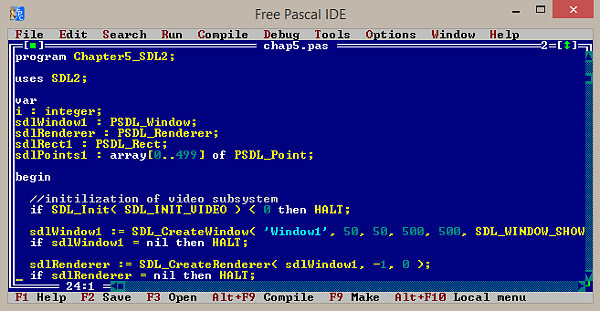 7b) For Free Pascal IDE: Extract the Pascal-SDL-2-Headers-master.zip. I suggest to copy all the files to a folder with full path C:\FPC\[Compiler Version]\units\SDL2\. [Compiler version] should be 3.0.0 or higher numbers. All later chapters will assume you installed to this path. Now the compiler has to be told where to find the new units. 8) Open the Free Pascal IDE (for example by clicking the shortcut on desktop). 9) In Lazarus the path to external units has to be set for each project. Create a project if no project is set up (Project > New Project …). In the menue choose the following item Project > Project Options …. Now a window should pop up. 10) Under “Compiler Options” choose “Paths” (see red mark). Choose the three dots button (see red mark on the right side) for the “Other units files (-Fu)” field (red mark). This makes the “Path Editor” pop up. In the area “Search paths:”, click on the yellow folder symbol in the right bottom corner. Choose the path to your SDL-units (e.g. C:\Lazarus\2.6.4\units\SDL2). Make sure the path leads to the folder, where the sdl2.pas file is located! This file contains all the basic features of SDL 2.0. Confirm by clicking “OK” until all windows are closed. Your Lazarus IDE is now set up for SDL 2.0 application development :-)! 9) In the menue choose the following item Options > Directories…. Now a window should pop up. 10) The first tab whitin this new window is called “Units”. Here you add the full path to your SDL-units (e.g. C:\FPC\3.0.0\units\SDL2) right below the other paths. Leave the last backslash out. Make sure the path leads to the folder, where the sdl2.pas file is located! This file contains all the basic features of SDL 2.0. Since the screenshot is old, the compiler version has been 2.6.2, which is reflected in the shown pathes. It should be 3.0.0 or higher numbers for you. where the programs are placed. Now it should work. unfortunately I’m not familiar with neither Geany nor Notepad++. 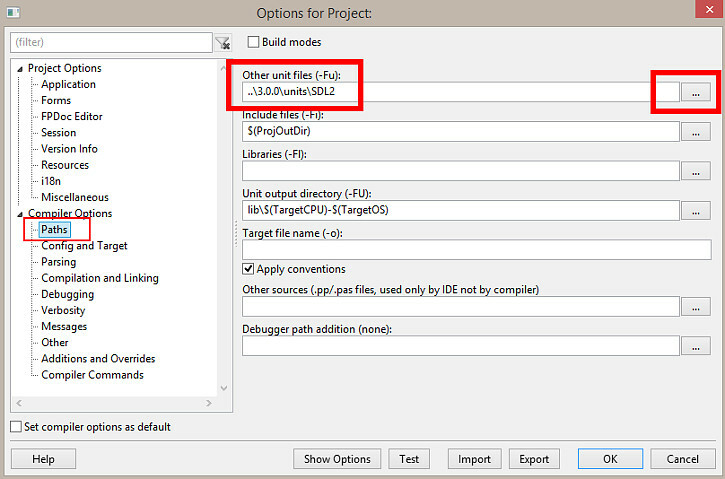 You may look into the documentations of either editor where to find the option to set up unit/header files. Had some weird results on Linux with the SDL2 units, had to rename them to use lowercase prefixes (i.e sdl2_image instead of SDL2_image). The project using the units would build fine in Lazarus, but code completion (ctrl+space) triggered errors (unit not found), and compiling from command line also reported errors about missing units. Might be the same case on OSX, haven’t tried it yet. I have followed your installation guide for SDL2 for FPC under Linux and I even followed the other fella’s advice on renaming the captital SDL2_gfx.pas Ect. And as far as I know FPC finds it and everything but for some reason when i try to compile the example in your getting started tutorial it keeps giving me an Error 5 message saying that it cannot create SDL2.o or somthing like that. do you know what is happening ?. below is my system config. I have never had this many problems on linux before or with FPC for that matter. Thanks in advance for any and all help or suggestions on how to fix this problem. Well, I wonder why would you use the SDL2 Linux Dev files and try to compile the library yourself, I’m sure Ubuntu has the library pre-compiled in their package manager for you :-). Or do you really need the very last release version of SDL2? I just released a short Linux installation instruction. Maybe it can help. Please let me know if you succeeded in getting it run. @Rickmeister: I tried it now. I unfortunately (or fortunately?) can’t confirm these troubles. I could compile chapter 3-9 without any trouble and the code completion doesn’t trigger errors for me.